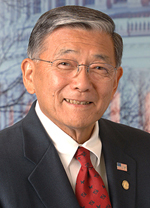 Former U.S. Secretary of Transportation Norman Y. Mineta will be the keynote speaker at the 4th annual U.S.-Japan Green Conference, set for Thursday, May 27, at the Omni Los Angeles Hotel. The conference, organized by the Japan America Society of Southern California, will focus on the future of high-speed rail transit in California. In 2008, voters approved a ballot measure to fund a first-in-the-nation rail system that will travel at speeds similar to those in Japan and Europe, to link major cities in California and to do so with reduced emissions. Recent focus on rail projects in the state has been accompanied by many questions, concerning topics such as cost, feasibility and safety of a new train system. The discussion will be moderated by Michael Kodama, the executive director of the Orangeline High Speed Rail Project, and is expected to include panelists from Mitsubishi Electric Transportation, Siemens, the California High-Speed Rail Authority and the East Japan Railway Company. The conference begins at 1:30 p.m. on May 27, with Mineta delivering his remarks at 4:30. Admission is $40 for JAS members, $50 for non-members and $25 for students. The Omni Los Angeles Hotel is located in California Plaza at 251 South Olive Street. Visit www.jas-socal.org for more information.